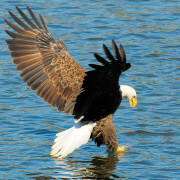 The bald eagle was declared the nation’s symbol back in 1782. 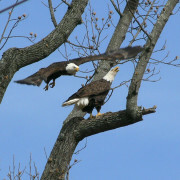 After nearly vanishing from the nation it represents, the American bald eagle has soared off the endangered species list. 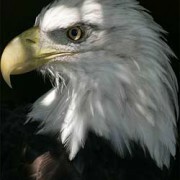 Pigeon Forge, TN – June 26, 2007 — With the bald eagle scheduled to lose its Endangered Species Act (ESA) protection and related federal funding before June 29th, the American Eagle Foundation wants to inform concerned citizens and conservationists that their national symbol still needs help. 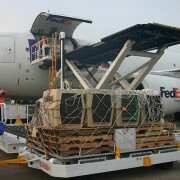 Pigeon Forge, TN, May 4, 2007 – Yesterday evening at 9:15 p.m., the first two of seven young Bald Eagles (or “eaglets”) from the San Francisco Zoo will touch down at McGhee Tyson Airport in Knoxville, via Delta Airlines. 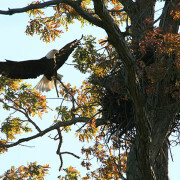 The American Eagle Foundation (AEF) received the U.S. 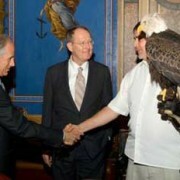 Fish & Wildlife Service (USFWS) Conservation Award on May 1, 2007 at a special ceremony in Atlanta. 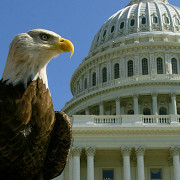 American Eagle Foundation announces new endowment fund to support eagle monitoring and protection nationally after bird loses Edanagered Species Act protection and related government funding – Americans invited to build $100 million “nest-egg” for U.S. freedom symbol. Pigeon Forge, TN, October 17, 2006 – The American bald eagle is set to be stripped of its Endangered Species Act (ESA) protection. The anticipated date is by June 29, 2007. With more than 7,000 pairs in the lower 48 states, eagle numbers have jumped markedly from the 417 pairs tallied in the DDT-driven 1960s – but many Americans remain unconvinced that the eagle is truly home free. St. Paul, Minn. – (AP) – The U.S. 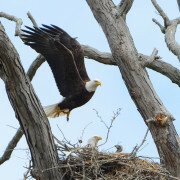 Fish and Wildlife Service said Friday it is working to remove the Bald Eagle from the list of endangered species, following a court decision ordering it do so by Feb. 16 unless it can prove further delays are necessary. 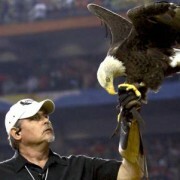 Challenger is the country’s most famous Bald Eagle, flying at sports events from stock car races to the World Series. He may well be our most powerful ambassador for wildlife, too, with an all-American appeal that no one can resist. WASHINGTON, Dec. 27, 2004 — Just in time for the New Year, the “American Bald Eagle Recovery & National Emblem Commemorative Coin Act” (H.R. 4116) has been signed into law by President George W. Bush to celebrate and further aid the recovery of the American Bald Eagle. During the final hours of the 108th Congress, the House of Representatives and Senate passed the legislation by unanimous consent right after the Intelligence bill was voted on. WASHINGTON, DISTRICT OF COLUMBIA, December 9, 2004 – While Congress was busy debating and passing a suitable Intelligence bill to help defend our nation’s security and freedoms, the very symbol of those rights (and the U.S.A. itself) was also getting a big boost to secure its own future health and welfare. 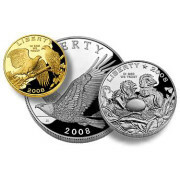 The “American Bald Eagle Recovery & National Emblem Commemorative Coin Act” (H.R. 4116 & S.2889) was unanimously passed by the House and Senate by the end of the 108th Congress on Wednesday evening. WASHINGTON, DISTRICT OF COLUMBIA, May. 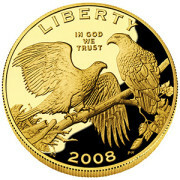 12, 2004 -/E-Wire/– On June 20, 1782, the U.S.A.’s Founding Fathers selected the Bald Eagle as the central image of the United States national emblem at the Second Continental Congress. 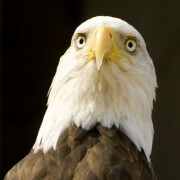 Since then, this majestic bird has come to represent the spirit of Freedom and Democracy that makes our nation great.